Definition at line 58 of file llfloaterdirectory.h. Definition at line 69 of file llfloaterdirectory.cpp. References LLUICtrlFactory::buildFloater(), LLPanel::childSetTabChangeCallback(), createClassified(), createClassifiedDetail(), createEventDetail(), createEvents(), createFindAll(), createFindAllOld(), createGroupDetail(), createGroupDetailHolder(), createGroups(), createLand(), createPanelAvatar(), createPeople(), createPlaceDetail(), createPlaceDetailSmall(), createPlaces(), createPopular(), gUICtrlFactory, mClassifiedPanel, mEventsPanel, mFindAllPanel, mLandPanel, LLFloater::moveResizeHandlesToFront(), mPanelAvatarp, mPanelClassifiedp, mPanelEventp, mPanelGroupHolderp, mPanelGroupp, mPanelPlacep, mPanelPlaceSmallp, mPopularPanel, NULL, onTabChanged(), onTabChangedFindAll(), LLPanelAvatar::selectTab(), and sInstance. Definition at line 130 of file llfloaterdirectory.cpp. References FALSE, gSavedSettings, mPanelAvatarp, mPanelClassifiedp, mPanelEventp, mPanelGroupHolderp, mPanelGroupp, mPanelPlacep, mPanelPlaceSmallp, NULL, LLControlGroup::setBOOL(), and sInstance. Definition at line 152 of file llfloaterdirectory.cpp. Definition at line 213 of file llfloaterdirectory.cpp. Definition at line 237 of file llfloaterdirectory.cpp. References LLUICtrlFactory::buildPanel(), FALSE, and gUICtrlFactory. Definition at line 160 of file llfloaterdirectory.cpp. Definition at line 144 of file llfloaterdirectory.cpp. Definition at line 206 of file llfloaterdirectory.cpp. Definition at line 247 of file llfloaterdirectory.cpp. References FALSE, gAgent, and LLAgent::getGroupID(). Definition at line 259 of file llfloaterdirectory.cpp. Definition at line 199 of file llfloaterdirectory.cpp. Definition at line 183 of file llfloaterdirectory.cpp. Definition at line 223 of file llfloaterdirectory.cpp. Definition at line 192 of file llfloaterdirectory.cpp. Definition at line 268 of file llfloaterdirectory.cpp. Definition at line 278 of file llfloaterdirectory.cpp. Definition at line 176 of file llfloaterdirectory.cpp. Definition at line 168 of file llfloaterdirectory.cpp. Definition at line 369 of file llfloaterdirectory.cpp. References LLTabContainerCommon::getCurrentPanel(), LLUICtrlFactory::getTabContainerByName(), LLPanel::setFocus(), and TRUE. Referenced by showPanel(), and toggleFind(). Definition at line 458 of file llfloaterdirectory.cpp. Referenced by handle_track_avatar(), and LLAgent::teleportCore(). Definition at line 502 of file llfloaterdirectory.cpp. References FALSE, mPanelAvatarp, mPanelClassifiedp, mPanelEventp, mPanelGroupHolderp, mPanelGroupp, mPanelPlacep, mPanelPlaceSmallp, and LLView::setVisible(). 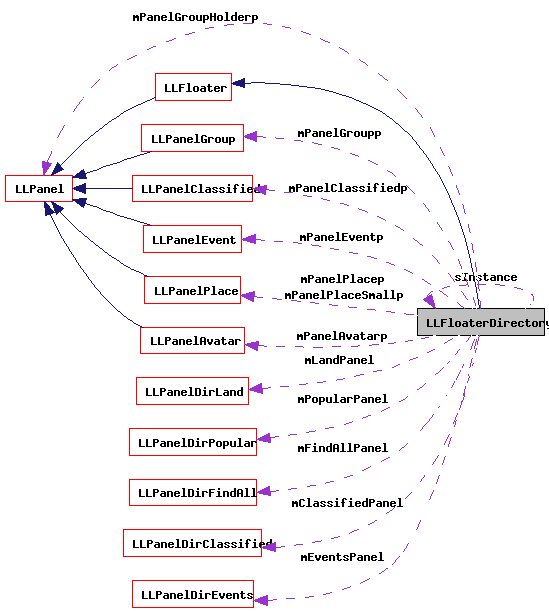 Referenced by LLPanelDirBrowser::setupNewSearch(), and LLPanelDirBrowser::showEvent(). Definition at line 473 of file llfloaterdirectory.cpp. Definition at line 479 of file llfloaterdirectory.cpp. References LLView::getName(), gSavedSettings, and LLControlGroup::setString(). Referenced by LLFloaterDirectory(), and onTabChangedFindAll(). Definition at line 492 of file llfloaterdirectory.cpp. Definition at line 360 of file llfloaterdirectory.cpp. References LLGroupMgrObserver::getID(), mPanelGroupp, LLPanelGroup::refreshData(), and sInstance. 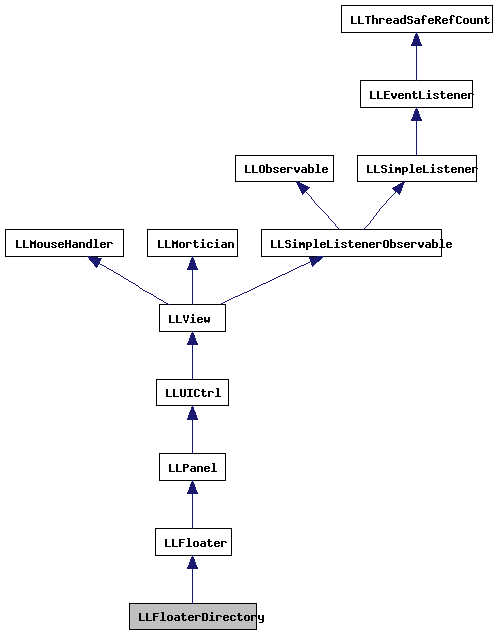 Referenced by LLAgent::processAgentDropGroup(), LLGroupMgr::processJoinGroupReply(), and LLGroupMgr::processLeaveGroupReply(). Definition at line 288 of file llfloaterdirectory.cpp. References mClassifiedPanel, LLPanelDirClassified::performQuery(), and sInstance. Definition at line 467 of file llfloaterdirectory.cpp. Definition at line 303 of file llfloaterdirectory.cpp. References mClassifiedPanel, LLPanelDirBrowser::selectByUUID(), showPanel(), and sInstance. Definition at line 315 of file llfloaterdirectory.cpp. References mEventsPanel, LLPanelDirEvents::performQuery(), LLPanelDirBrowser::selectEventByID(), LLPanelDirEvents::setDay(), showPanel(), and sInstance. Referenced by LLWorldMapView::handleDoubleClick(), LLEventNotifier::notifyCallback(), and toggleEvents(). Definition at line 296 of file llfloaterdirectory.cpp. References mFindAllPanel, LLPanelDirFindAllInterface::search(), showPanel(), and sInstance. Definition at line 354 of file llfloaterdirectory.cpp. Definition at line 343 of file llfloaterdirectory.cpp. References mLandPanel, LLPanelDirBrowser::selectByUUID(), showPanel(), and sInstance. Definition at line 381 of file llfloaterdirectory.cpp. References LLPanel::childShowTab(), focusCurrentPanel(), LLFloaterDirectory(), LLFloater::open(), and sInstance. Referenced by showClassified(), showEvents(), showFindAll(), showGroups(), showLandForSale(), showPopular(), and toggleFind(). Definition at line 332 of file llfloaterdirectory.cpp. References mPopularPanel, LLPanelDirBrowser::selectByUUID(), showPanel(), and sInstance. Definition at line 429 of file llfloaterdirectory.cpp. References LLPanel::childGetVisibleTab(), LLFloater::close(), LLView::getVisible(), mEventsPanel, LLFloater::open(), showEvents(), and sInstance. Definition at line 396 of file llfloaterdirectory.cpp. References LLFloater::close(), focusCurrentPanel(), LLControlGroup::getString(), LLView::getVisible(), gSavedSettings, mEventsPanel, NULL, LLFloater::open(), LLPanelDirEvents::setDay(), showPanel(), and sInstance. Referenced by handle_find(), and LLEditSearch::handleEvent(). Definition at line 97 of file llfloaterdirectory.h. Referenced by LLFloaterDirectory(), requestClassifieds(), and showClassified(). Definition at line 98 of file llfloaterdirectory.h. Referenced by LLFloaterDirectory(), showEvents(), toggleEvents(), and toggleFind(). Definition at line 96 of file llfloaterdirectory.h. Referenced by LLFloaterDirectory(), and showFindAll(). Definition at line 100 of file llfloaterdirectory.h. Referenced by LLFloaterDirectory(), and showLandForSale(). Definition at line 132 of file llfloaterdirectory.h. Definition at line 123 of file llfloaterdirectory.h. Referenced by hideAllDetailPanels(), LLFloaterDirectory(), LLPanelDirBrowser::showDetailPanel(), and ~LLFloaterDirectory(). Definition at line 129 of file llfloaterdirectory.h. Referenced by hideAllDetailPanels(), LLFloaterDirectory(), LLPanelDirBrowser::newClassified(), LLPanelDirBrowser::showDetailPanel(), and ~LLFloaterDirectory(). Definition at line 124 of file llfloaterdirectory.h. Referenced by LLPanelDirBrowser::getSelectedEventID(), hideAllDetailPanels(), LLFloaterDirectory(), LLPanelDirBrowser::selectEventByID(), LLPanelDirBrowser::showEvent(), and ~LLFloaterDirectory(). Definition at line 126 of file llfloaterdirectory.h. Definition at line 125 of file llfloaterdirectory.h. Referenced by hideAllDetailPanels(), LLFloaterDirectory(), refreshGroup(), LLPanelDirBrowser::showDetailPanel(), and ~LLFloaterDirectory(). Definition at line 127 of file llfloaterdirectory.h. Definition at line 128 of file llfloaterdirectory.h. Definition at line 99 of file llfloaterdirectory.h. Referenced by LLFloaterDirectory(), and showPopular(). Definition at line 133 of file llfloaterdirectory.h. Referenced by hide(), LLFloaterDirectory(), refreshGroup(), requestClassifieds(), showClassified(), showEvents(), showFindAll(), showLandForSale(), showPanel(), showPopular(), toggleEvents(), toggleFind(), and ~LLFloaterDirectory().